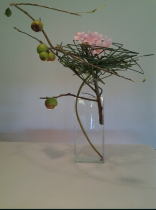 Modern life is reflected in Sogetsu Ikebana with emphasis on individual expressions. Natural and manmade materials are widely used, often in unexpected ways. Sofu Teshigahara, the founder of the Sogetsu School of Ikebana, was born in 1900. He was the first son of Wafu Teshigahara, an ikebana artist, who trained Sofu in ikebana since childhood. As he practiced and taught ikebana, he came into conflict with a milieu where ikebana was seen as the continuing attempt to recreate the existing forms. Why should it always take the same form in spite of being arranged by very different people? Why didn’t it reflect their individual lives? He left his father’s school when he was twenty six and founded the Sogetsu School in 1927, where he developed his way of teaching creative ikebana. In 1929, the Sogetsu School held its first exhibition at the Sembikiya in the Ginza. 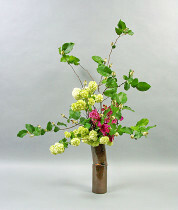 His modern style of ikebana made Sofu’s reputation overnight. From this base, he produced work after work exploring the borders of ikebana, overthrowing the common sense of ikebana and the concept of containers and materials. After Sofu’s death in 1979, his daughter Kasumi Teshigahara became the second Iemoto. She passed away shortly thereafter and was succeeded by Hiroshi Teshigahara, the third Iemoto of Sogetsu School in 1980. Hiroshi was a well respected film director and well known for creating spectacular bamboo installations. He died in the spring 2001. His daughter, Akane Teshigahara, succeeded him as the fourth Iemoto. As was her father, she is a powerful installation artist who believes that ikebana must be incorporated in all aspects of contemporary life. My name is Elvia Carrasco from Mexico, Iam interested in havin an intensive course whit you, if you have any please let me nkow. Thank you. 1) Are there any evening or weekend classes in South Bay / Burlingame Area? 2) I’d like to talk about commissioning some arrangements from students, for my wedding in January 2016. Please let me know if this is possible and what the next steps would be. Dear Justine, I am so sorry for this late reply as I have been out of town. Our chapter has many great Sogetsu ikebana teachers. 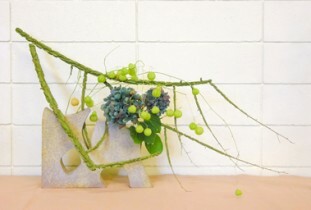 Please refer to the website under “Schools of Ikebana”, scroll down to “Teachers List”. There you can select a teacher who is close to where you live. If you have not found someone to do the arrangements for your wedding, I would like to refer to you an outstanding Sogetsu artist, who makes arrangements for events. His name is Ricardo Ramirez, tel 415-734-7377, email ramirez72@hotmail.com . Please let me know if I can of any further assistance. Best Wishes to you!! I. Studied, ikebana with K. Dickson a numbed of years ago and am hoping you may know of classes in Indianapolis, IN. I am sorry, I don’t have any information about ikebana classes in Indianapolis. Do you sell Sogetsu DVDs in English? We have DVD’s of past Ikebana shows that includes Sogetsu arrangements, but not DVD just Sogetsu.